For the first time in the history of this blog I have removed a post – well two actually. 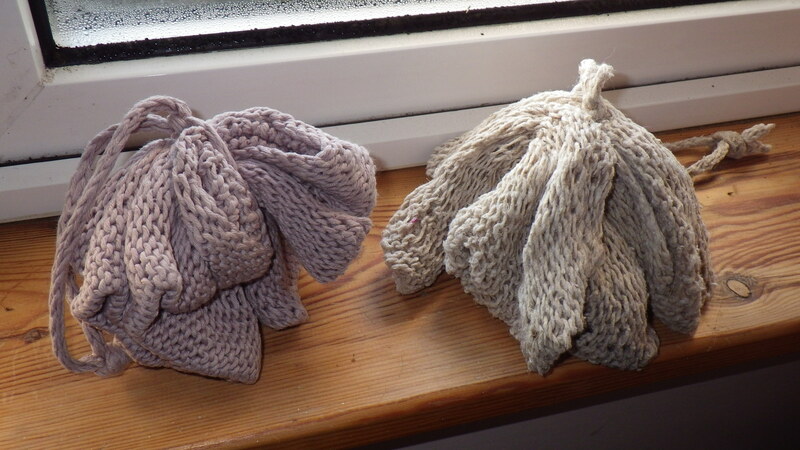 Many moons ago I was interested in environmentally friendly alternatives to nylon bath puffs (scrubbies). I wrote a number of posts on the subject and explored a range of fibres to use. At the time, I was delighted to discover how well reclaimed acrylic yarn worked and I wrote a post about it. At the time, and with the information I had to hand, it seemed like a great way to use something that would otherwise simply be thrown out (yarn unravelled from old knitwear). Now, it turns out it was not such a good idea. Just like making fleece fabrics from recycled plastic bottles, which we all thought at the time was a great way to use waste, new information has made me think again. 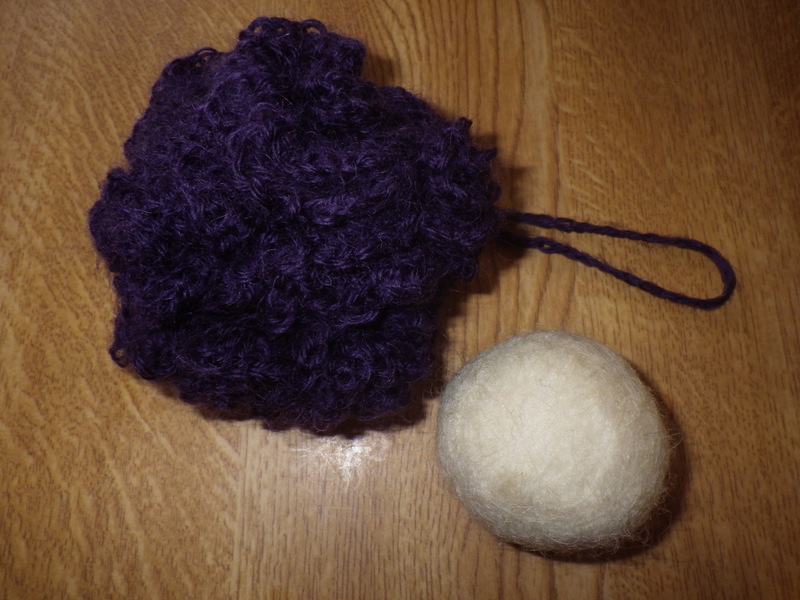 Using manmade fibres in bath puffs will add to microfibre contamination of water unless there is a fine filter on the bath/shower outlet, which seems unlikely. So, the two posts that mentioned using acrylic yarn for this purpose have been removed to prevent encouraging anyone else to try it. 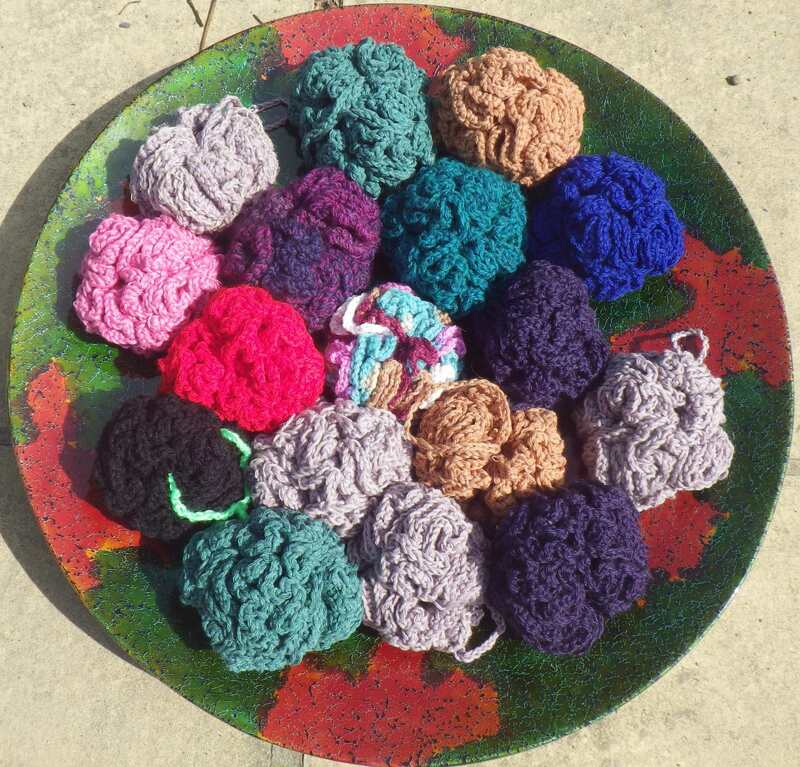 It’s still easy enough to make bath puffs or cloths with natural fibres – cotton, hemp, nettle, or even wool, depending on the texture you desire. However, I like Kate‘s recent suggestion (see the comments in this post) about using loofahs if you want something with a rougher texture for washing yourself or your pots. If I spot some seeds, I may well have a go at growing my own – now that really would be a green solution. However, since starting to use bar soap, I’ve had no need for a bath puff. My favourite soap to use after swimming (ginger and lime) has little bits of ground ginger root in it and these provide all the exfoliation I need – naturally and biodegradably. I have also made myself (or been gifted) several cotton wash cloths/flannels and these are especially useful when travelling or when water is limited. The moral of the story is that we do the best we can with the knowledge that we have at any given time, but that it’s important not to get stuck in a rut (or get defensive) and to make changes when new information comes to light. Have you had to revise your thinking on anything recently? A couple of months ago a friend of mine posted on Facebook that he was seeking ‘green’ alternatives to two common items: cotton buds and a bath puff. I decided to take up the challenge. First, I wanted to discover if there were any patterns out there to knit such things. A quick search on the Ravelry website revealed lots of crochet patterns and a few ones to knit. So, I selected a knitting pattern that looked like it had potential and considered appropriate yarns. Various patterns suggested using ‘dish cloth cotton’ – a yarn type that seems to be widely available in the US but not in the UK. The pattern that I had bought suggested a yarn made of 100% nettle fibre yarn that, again, I could not buy in the UK. Some searching of the interweb helped me to identify various potential alternative yarns and several sources for these. Of course, however a seller describes a yarn, until you are using it, you can’t really appreciate its properties, so this is where the experimentation (and associated expense began). First, I found some organic cotton yarn in an e-bay auction. Although the colour was not what I would have preferred, I managed to put in a winning bid and so received a few balls of yarn to try out. I knitted it up to a slightly adapted version of the pattern I had bought and tried it out in the shower. And discovered that… cotton is remarkably absorbent. That’s why they make towels out of it. What I had created was, basically, a flannel (washcloth) on a string. In fact, it’s quite nice to wash with, but it’s not a replacement for the nylon version. In addition, the pattern that I used made something that even looked rather like a scrunched up flannel on a string! I decided to try an alternative yarn. This time I tracked down some hemp and cotton blend yarn. I really wanted to test out the characteristics of the yarn, so I decided to stick to the same pattern as before. Once more unto the shower… a little more abrasion this time, but still really quite absorbent… and still looking rather like a scrunched up flannel on a string… and it takes an age to dry, so has the propensity to become smelly if you forget to hang it up in an airy place after use (also, as a result, no good for travelling). 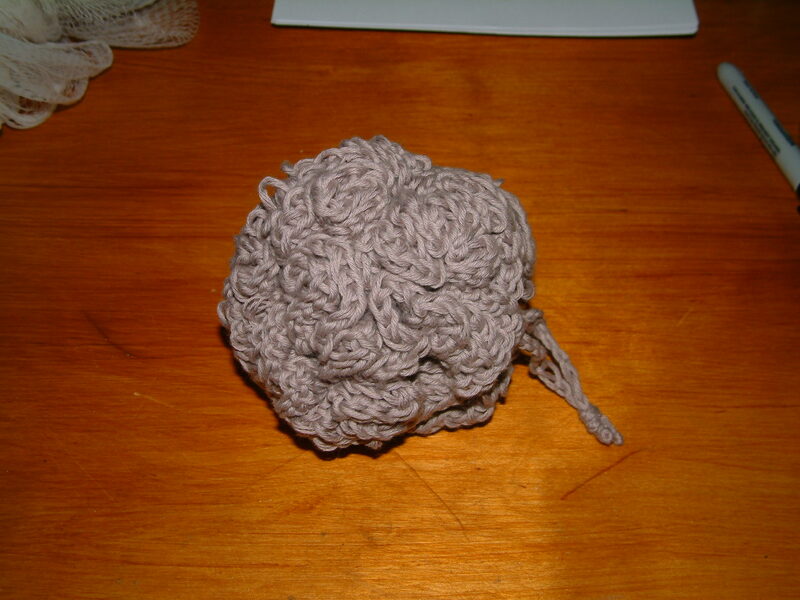 Well, ok, the colour doesn’t help, but that aside it does look like both a brain and something you might use to wash with. And in fact it turns out to be lovely and soft, and fine to wash with, but not textured enough to provide an invigorating showering experience! And it stays soggy for a long time. I concluded that I had found a suitable pattern, but not a suitable yarn. 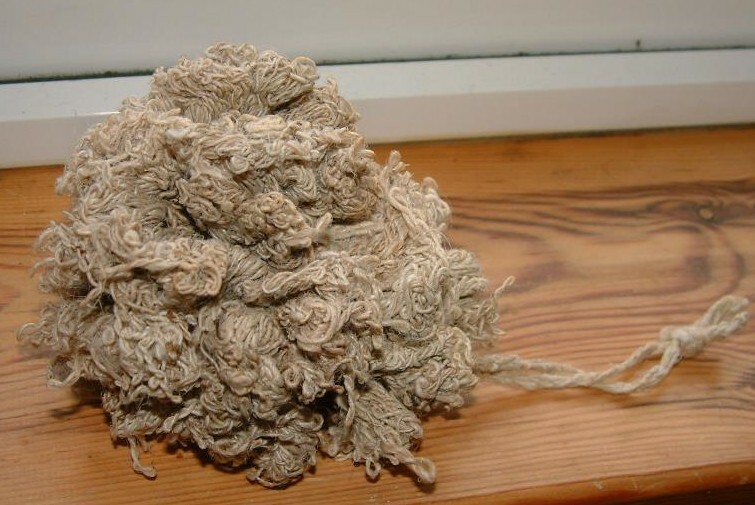 Cotton and cotton blends seem to me to be too absorbent; anything with wool in is likely to turn into felt with all the soap and rubbing, and so I turned from yarn to what could best be described as twine. This tends to be made out of plant fibres, has a narrower gauge than knitting yarn and is often quite rough. The fact that it is thin means that any pattern designed for thicker yarn would have to be modified, but that is not an insurmountable problem. So, the latest incarnations are one in bamboo and one in nettle twine. Both are still more absorbent than nylon, but I think that this is a fact that I will simply have to accept with any natural fibre. The bamboo is quite silky, so not very abrasive (and the one I made was a bit on the small side). The nettle twine is better, with some texture, so this is the version that I have sent off to my friend… I await his verdict. The pattern needs some modification for use with the twine to make it a little more bulky (the one pictured is a bit loose) but I feel that I am homing in on a solution. I’ve also got some hemp twine to experiment with, although I think that might have a bit too much texture! This does mean that our house is filling up with a wide variety of things to wash with – some more efficient than others – so if nothing else we should have no problems keeping clean for years to come! February 2013: After further research, there is a new post here with more information on the crochet pattern and a yarn that seems to work! October 2013: I now have bath puffs for sale… details to the right and more info and pictures here.